Original-Video shows its video ATM to the American public at the VSDA's Home Entertainment annual convention in Las Vegas. 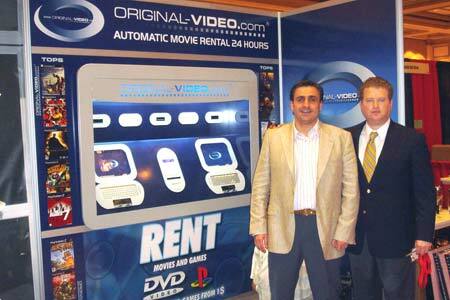 In this photo, Diego Espinosa, President of Original-Video and Tomás Fernández, CEO of Original Video North America. Original-Video, a manufacturer of automated video stores for video and DVD rental, has adapted its automated distributor OVCOM2 to the needs of the American market, with the objective of strengthening its company expansion in the US, Mexico and Canada. The first steps of this strategy of internationalization have been taken at the VDSA's Home Entertainment annual convention celebrated in Las Vegas, which was the place chosen by the trademark to perform the introduction of the new video ATM. In this sense and from the stand located in this international contest, the people of Original-Video had the opportunity to show to the many entrepreneurs interested in this business, the unique features of this video ATM. Among them, the on-line management system, that allows to manage the video stores from anywhere in the world and that has been the product of an intense work of more than a year of market research and technological development, was the most outstanding feature. The Original-video video store has awakened a great interest in the American market, since it incorporates important functionalities, both for the management and the final user. For instance, its interactive keyboard, exclusive of Original-Video, provides total freedom to the owner of the video store by allowing new memberships from the machine 24 hours, and provides the possibility to the member to access without a card and to communicate with the person in charge of the store. In this sense, the OVCOM2 provides to the investors a business suitable to our times, with all the possibilities provided by automating a business activity that has flexible schedules, management easiness and that can be adapted to a minimal space, but without loosing the contact and relationship with the customer. Definitely, the OVCOM2 video ATM is a product made with the final user in mind with many functions for the business manager. The world-wide company Original-Video.com is present in Portugal, United Kingdom, Ireland, Chipre, USA, Mexico, Brazil and Spain. Part of the short-term plan of the company is to gain market share, to continue with the international expansion and to keep on the cutting edge of technological innovation with new ideas and concepts in order to continue the leadership in the market and to be able to transmit this know-how to the international market.